The Zika virus is carried by the aedes aegypti mosquito, which is commonly found in southern U.S. states. Efforts to stop the spread of the Zika virus within the U.S. have been largely focused on minimizing the risk of sexual transmission of the disease by infected travelers. But the unseasonably warm weather and the expected onslaught of mosquitos are redirecting the spotlight on the perpetrators: the Aedes aegypti and Aedes albopictus mosquitos. Reducing the number of the virus' primary carriers, however, will require new and costly strategies. And years of budget cuts to local and state mosquito abatement programs, some in the country's most vulnerable areas, could lead to uneven or ineffective surveillance and abatement. 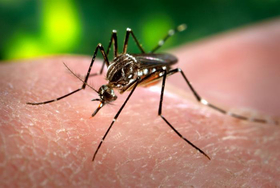 The nature of the Aedes mosquito makes aerial spraying of pesticides and eliminating large breeding sites – both strategies that have successfully controlled populations of the West Nile-carrying Culex mosquito – less effective. Normal control programs focus on spraying insecticides in areas such as wetlands and sewers, places with standing water that make ideal breeding grounds for mosquitoes. But the Aedes mosquito only requires about the equivalent of a bottle cap full of water in order to breed, making it harder to find. Aedes has become highly adaptable to areas where humans reside, settling in beds or underneath lawn furniture. They tend to bite on lower extremities, and can bite as many as 15 people before they have had a full meal. Dyjack said public health officials need a door-to-door outreach strategy to educate people how to prevent the mosquito's chances of breeding and feeding. But many local and state public health departments aren't fully staffed. A report by the Council of State and Territorial Epidemiologists found between 2004 and 2012 there was 41% decline in the number of staff working at least half time on mosquito surveillance to track West Nile across 48 states. During the same period, 58% of U.S. states reduced their mosquito trapping activities and 68% reduced their mosquito testing, according to the report, which described the country's capacity to conduct mosquito surveillance as “patchy”, with few states having robust programs and many having few to no resources. Joe Conlon, spokesman for the American Mosquito Control Association said they're looking for federal funds that can come down through the Centers for Disease Control and Prevention to help mosquito control districts localize their testing regimens. “The more local we make it, the faster results we are going to get and the faster that intervention measures can be instituted,” he said. Revitalizing mosquito control efforts became a topic of discussion during a hearing held Thursday by the U.S. Senate Committee on Homeland Security and Governmental Affairs when lawmakers asked whether a federal response was needed. “We need at the federal level to have the technical assistance and the ability to supplement what the states and localities can do,” said Rear Admiral Dr. Anne Schuchat, CDC principal deputy director. Earlier this month, the CDC released a draft plan on responding to local cases of Zika infestation. The agency intends to address mosquito control as part of an overall response to Zika, but those efforts so far have been mired in political gridlock over funding. The latest attempt to pass a bill in the Senate that would have allocated $1.1 billion toward fighting Zika failed on Tuesday over the objections of Democrats regarding provisions included in the measure that would have loosened environmental regulations and banned funding to Planned Parenthood. Meanwhile, Texas and other states in the South expected to be hardest hit by the Aedes aegypti mosquito are scrapping together funds. Texas's state health department has spent more than $400,000 since the start of the year to expand its lab capacity and to buy mosquito traps. Still, smaller, more rural communities have limited or no mosquito surveillance. Most of those towns must rely on outside labs to conduct their testing, which can take weeks to get back results. So far, no mosquitoes have tested positive for Zika. As of June 22, more than 800 people have been infected with Zika, according to the CDC. So far, none of the cases reported have been the result of a mosquito bite that occurred in the U.S.